April showers bring May flowers… which can both bring pesky mosquitoes. But with the proper treatments, these pests don’t have to ruin your outdoor activities or keep you from enjoying the warm weather. Eliminate sources of standing water. Mosquitoes can lay their eggs in as little as one inch of stagnant water, so it’s important to eliminate everything you can. Pay attention to swimming pools, gutters, garbage cans, drains, bird baths, flower pots, pet food bowls, and any areas near your home where puddles tend to fill up. Use yellow bug light bulbs. Mosquitoes and other bugs are attracted to many lights, so it can be tough to enjoy a warm night outside. Consider using yellow “bug lights” instead. These are tougher for bugs to see, so you can expect to see fewer of them around at night. Keep your lawn clean and cut back on vegetation near the home. These areas serve as places for mosquitoes to breed and rest, so it’s important to cut back. This doesn’t mean getting rid of that garden you’ve been working on since you moved in. Also, leaves can be a breeding ground for mosquitoes, so keeping your lawn clean can do more than just add some extra curb appeal to your home. Be sure to rake regularly and throw away any sticks or leaves you may find. Be mindful of where you have food. 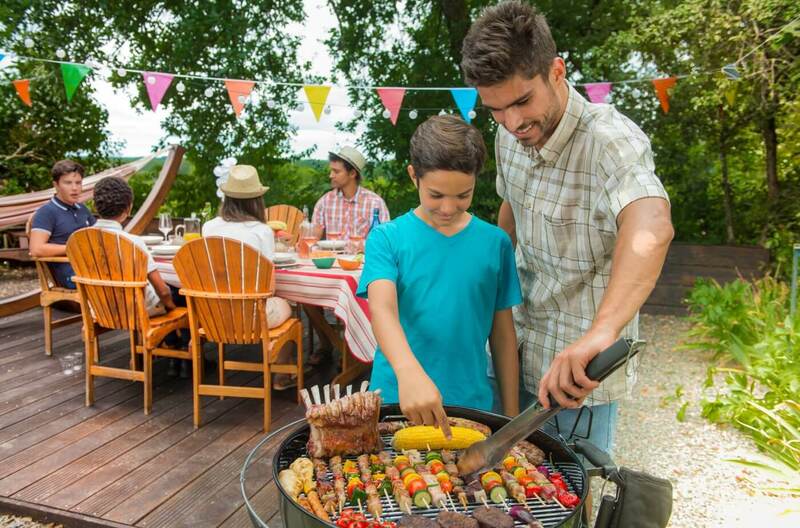 Yes, it is possible to have a picnic or cookout without being bugged by mosquitoes your entire meal. Keep your food away from water sources, and be sure to keep food covered as often as possible. Plus, you can also get a one-time mosquito treatment a few days before your event to help ward them off even more. Pay attention to scents. Bugs are attracted to fruity and floral scents, so consider using unscented toiletries on days when you’re most concerned about mosquitoes. Be sure to stay away from using scented candles outside — including citronella candles. That’s right! A recent study found that most citronella candles and other mosquito preventions don’t actually live up to their labels’ promises. In this study, DEET and oil of lemon eucalyptus sprays were the most successful in repelling mosquitoes, so consider using these methods instead. Check windows and doors. Check the seals on doors and windows, and make sure that windows, doors and porches are screened off properly. Call Bug House. The best thing you can do for your family is call in the pros to treat your yard for mosquitoes. Shortly after a rainy day is the best time for treatment. It only takes 10-14 days after rain for mosquitoes to repopulate, so it’s important to act quickly! Ready to protect your home and your family? Check out our treatment options and sign up for your free quote and in-home inspection today!